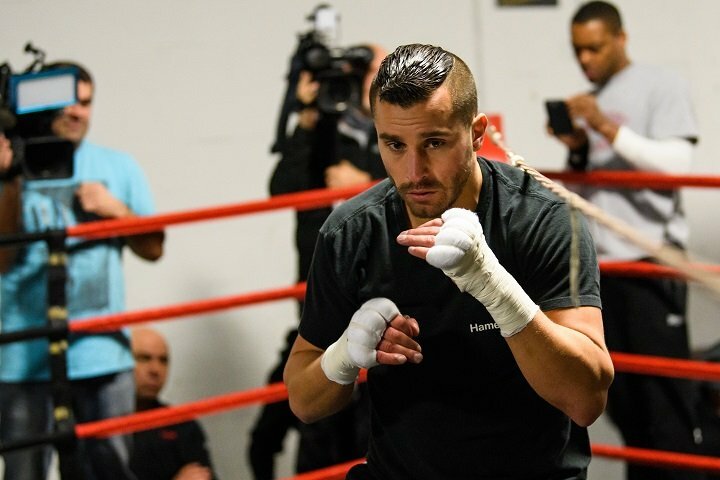 By Jim Dower: David Lemieux will be fighting this Saturday night against Karim Achour in a 12 round fight at the Centre Videotron in Quebec City, Quebec, Canada. Lemieux’s management has found what they obviously hope is an easy mark in 31-year-old France-based Karim Achour (26-4-3, 4 KOs). Lemieux doesn’t have anything to worry about as far as power from Achour, because he only has 4 knockouts on his resume and a 12% KO percentage during his 10-year pro career However, Achour has never been knocked out before. All four of his losses have been by decision to Mabil Bouneb, Haillah Mohoumadi, Martin Murray and Lukas Konecny. Achour has won his last eight fights since 2015. You can never rule out Lemieux losing to anyway, because his stamina is poor and he can be out-boxed when he gets tired. Lemieux SHOULD win this fight. If he gets beaten, then he’s going to have to think about retirement. Lemieux looks in really good shape for a change. He’s got his weight down, and it appears that he’s put in a lot of work in training camp. Lemieux is going to need to continue to do this if he doesn’t want to suffer additional losses. This is the first fight for former middleweight champion Lemieux (38-4, 33 KOs) since his one-sided embarrassing 12 round unanimous decision defeat at the hands of WBO 160lb champion Billy Joe Saunders last December at the Place Bell in Laval in Canada. Lemieux was dominated and taunted by Saunders for 12 rounds in front of his own boxing fans. Lemieux came into the fight with Saunders with a 4-fight winning streak and a lot of fans thinking he was going to beat him without any problems. Lemieux seemed to believe that as well, because he looked really heavy during the fight after struggling to make the 160lb limit. Lemieux looked emaciated at the weigh-in the day before the fight. That was the first sign that there was trouble brewing ahead for the 29-year-old former IBF 160lb champion Lemieux. The second sign was how stout Lemieux looked as he entered the ring for the fight. Lemieux looked like a swelled up water canteen. Lemieux clearly hadn’t put enough work in training camp in getting his weight down to a manageable level. As heavy as Lemieux was for the fight, he was too slow to get to the weaker but faster Saunders to hurt him. Saunders used his speed and movement to hit Lemieux a will shots for 12 rounds. Instead of the fight being one that favored Lemieux, it turned out to be a mismatch in favor of Saunders. Lemieux’s loss to Saunders hurt his chances for a fight against Saul Canelo Alvarez. Lemieux’s co-promoters at Golden Boy Promotions were rebuilding him to use as a possible Plan-B option for Canelo Alvarez to fight in September. The loss for Lemieux wiped out that option, and now he’s in the position where he needs to slowly rebuild his career over the next year or two. Lemieux is ranked #7 with the World Boxing Organization, so he should be able to get pushed up the rankings quickly as long as he stays busy in the next year. It’s going to be tough for Lemieux to win another world title now that guys like Demetrius Andrade, Jermall Charlo, Canelo Alvarez, Saunders and Sergey Derevyanchenko are around.